Comprehensive review of DERMAdoctor Picture Porefect. See how this retinol cream compares against other wrinkle creams! DERMAdoctor Picture Porefect is a great retinol serum. I saw really good results both short term and long term while using this product. It’s very hydrating– which is something you can’t say about all retinol serums! I normally don’t believe labels when they make “too good to be true” claims as to what the product can do for you, it always seems so “sales-ey” to me. My pores reduced in size almost immediately and over time it got progressively better. I gained that airbrushed glow to my skin, and my face was much smoother. The biggest (and really only) drawback for me was the smell. It doesn’t have the best fragrance, which made applying it a bit unpleasant. But overall I was really happy with my results, and loved what it did for my pores. DERMAdoctor Picture Porefect is a lightweight serum. It has a milky-to-clear pigment to it when you pump it out of the tube. Picture Porefect has almost a velvet-like texture, but you can’t feel it much on your skin. Applying DERMAdoctor Picture Porefect is really simple. After you cleanse your skin in the morning and night, you apply a thin layer all over your face. I did find this to be unusual because it’s not recommended to use retinol-based products and then be exposed to sunlight (as sunlight renders it inactive). So I think it makes sense to only use retinol products at night, this one included. Picture Porefect dries really quickly. The smell is not the greatest, and the biggest thing I don’t like about this product. I would compare it almost to the smell of a cheap self tanner. However, once DERMAdoctor Picture Porefect dries the smell dissipates, so that’s good at least. I used this for the first time under my makeup in the morning (as directed). I immediately noticed a difference with how my makeup went on that day. My skin appeared smoother and silkier instantly and I received 2 compliments on my skin that day. Long term I loved what this serum did for my skin! My face started to glow. And each and every day my skin got smoother, and appeared more flawless. My face almost seemed like it had an “airbrushed” quality about it. Just for the record, I didn’t experience any side effects. DERMAdoctor Picture Porefect contains an interesting blend of ingredients. The retinol in this product is used to help tone and tighten pores, instead of reducing lines and wrinkles. It has a very mild mix of ingredients and is great for people with sensitive skin. Willow bark is a natural anti-inflammatory, and can help with acne and to smooth skin. This formula is also gluten and dye-free which I really like. 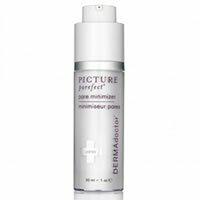 A one ounce tube of DERMAdoctor Picture Porefect is $42.00. Even though you’re supposed to use it morning and night, it doesn’t take a lot, so it goes a long way. $42.00 per ounce, while expensive, falls in the middle range of what these products cost. Given the results, I felt as if it was well worth the money! This product comes with a 30-day satisfaction guarantee, which is great. To buy DERMAdoctor Picture Porefect, click here. Texture/Feel It is a lightweight serum that has almost a velvet-like texture. Application After you cleanse your skin in the morning and night, you apply a thin layer all over your face. Drying Time Picture Porefect dries really quickly. Short Term Results My skin appeared smoother and silkier instantly. Long Term Results My face started to glow. And each and every day my skin got smoother, and appeared more flawless. Guarantee This product comes with a 30-day satisfaction guarantee, however, empty bottles can NOT be returned. Price $42.00 per ounce, while expensive, falls in the middle range of what these products cost.